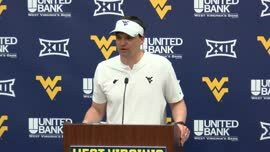 West Virginia Mountaineers defensive coordinator Vic Koeninng during the spring game on Saturday. 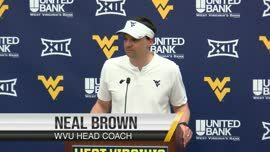 MORGANTOWN, W.Va. – Vic Koenning’s top priority as a defensive coordinator is stopping the run. 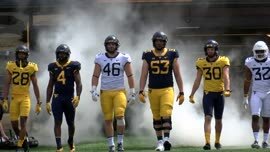 That being the case, his first dress rehearsal at West Virginia was an unqualified success. 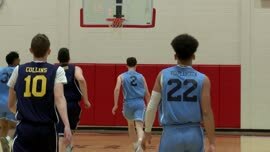 Going up against the No. 1 offensive line in the spring game, the first-string defense allowed 81 yards on 32 rushing attempts. Koenning made it clear that mentality is coming with him on the recruiting trail, as well. Koenning isn’t quite as pleased with where the Mountaineers are against the pass right now. Austin Kendall and Trey Lowe were a combined 11-of-19 for 205 yards against the top defense. Kendall victimized the defense with the deep ball several times, hitting completions of 60, 40 and 39 yards. 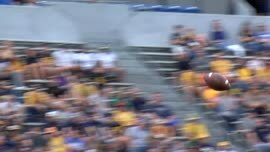 Lowe had a 28-yard touchdown pass on the final play of the scrimmage. That said, Koenning is hopeful his secondary will be less exposed in the season than it was during the spring game because quarterbacks will have less time to throw. “If you drop back and you know you’re not gonna get hit, you feel pretty good about it,” Koenning said. He imagined the life of a spring game quarterback being pretty easy. Koenning also needs more takeaways to be truly satisfied with the performance of his defense. His last two defenses at Troy ranked in the Top 20 nationally in takeaways. The lone turnover forced by the No. 1 defense in the spring game was a gift from Lowe, who forced a throw that was picked off by Keith Washington when he might have had a productive gain running the ball. The regular-season defensive product should look better – or at least more complex. Koenning stuck to the basics and did not call any blitzes Saturday. There are several specialized roles the Mountaineers have yet to determine. That part comes in August.